Having flown back from Taitung the six of media persons are back in Taipei, touring some local bike shops. Or rather, hunting for cool items that you can’t get in the states. 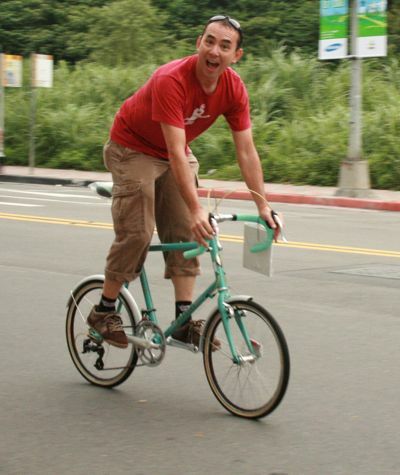 Cyclelicious was in a bit of turmoil over his inner need for a mini velo. 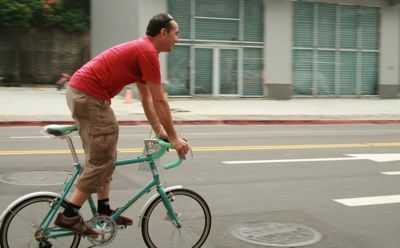 We had stopped at an Orbea shop, and he got to test ride a Bianchi Lepre, a dropbar mini velo. Among mini velos, what’s cool about the Bianchi is the retro styling. Exactly as I had anticipated, the shop carrying the Spanish-based Orbea bikes did have the Spanish helmet maker Catlike. 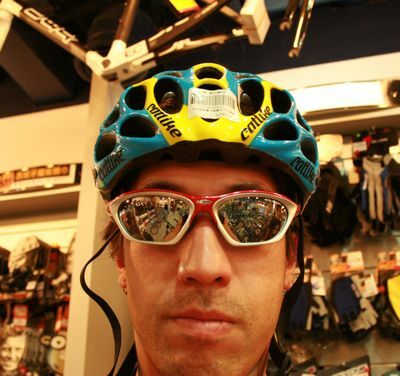 Catlike helmets meet the Euro safety tests but not the US, hence they are not available for sale within the states. The shop had a few older stock helmets in, because I tried on a 2009 helmet (size large) and found it too big. But this 2007 helmet (same nominal size) fit PERFECT. Not cheap, but I managed to rationalize the purchase.